Chris’ career in public accounting started in 2001. After spending five years in charge of the accounting department for a family business, Chris decided to make the move to public accounting and has never looked back. He is a Senior Manager in our Tax Department and is focused on helping family businesses both large and small in the Agriculture, Wine, and Manufacturing industries. Chris has always considered it his highest priority to be an advocate for his clients when it comes to the impact of income taxes on themselves personally and on their businesses. After all, a dollar saved in taxes is a dollar better used by an owner in their business. 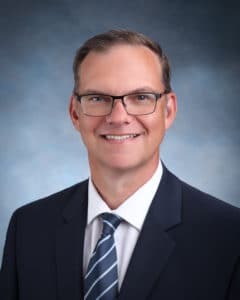 Chris earned a Master’s degree in Taxation from Golden Gate University and also hold a Bachelor’s Degree in Business Administration from the California State University, Stanislaus. Unplugged: Chris and his wife are parents to twin boys and are very involved in their activities at school. They’ve recently purchased a travel trailer and like to spend time camping and on the beaches in and around Pismo. Chris also served a term as Mayor for his city of Riverbank from 2004 to 2009. Chris found this opportunity to serve his fellow residents to be both an honor and a privilege.